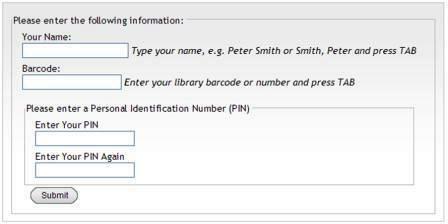 A personal identification number (PIN) allows you to login into your personal library record. You can login and view your transactions and fines, add preferred seaches and reading lists, see your reading history if you activate the Optin option, and modify your pin and email address. and have a valid email address registered in your library patron record. Please note that you must have a vaild email adrress in your patron record to use the above function. Contact the library staff to add a valid email address to your patron record if you do receive an invalid email warning. Type your name and surname in the first box. Use the TAB button to go to the next box. Type your library barcode number (the one at the back of your student/staff card) in the second box. Please follow the instructions in that message to reset your PIN. If you do not receive an email, please contact your librarian for assistance. Go to the relevant email and click on the link. The following form will display. Re-type your PIN in the last box.